HomeIs Live Inbox an alternative to Xobni? This is Sumanth from the Live Inbox team. Firstly, thank you for trying out our software and sorry about the issues you faced. We haven’t yet formally launched our solution but will be doing so this month (June 2011) once we have ironed out the final chinks. We are already working on the installation issues that you pointed out above. For the other performance issues, would you mind spending some time with us and help us figure out what the exact problem was. In return for your time, we would be glad to offer you a free lifetime license of the product (we promise you that you can file us under your “absolutely fantastic” category soon!). 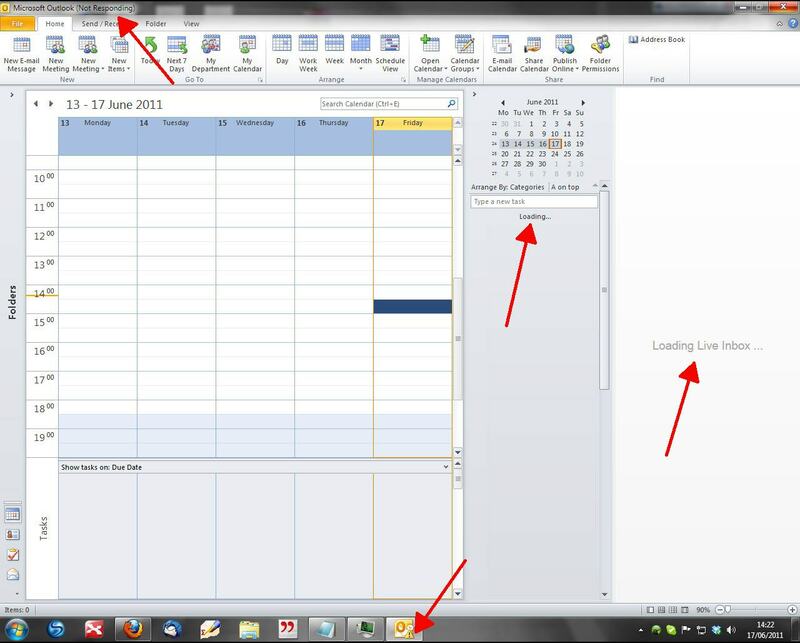 if this is acceptable, please drop me a line at sumanth@live-inbox.com at your convenience and we will duly follow up. Since you seem to be connecting to Exchange, there is a possibility that the issue might have arisen because you are not running it in cached mode. Were you able to run Xobni without these performance issues? Live-inbox is fighting against Xobni, but now they offer a site with lots of bla bla against, but they don’t offer an alternative right now…coming soon. 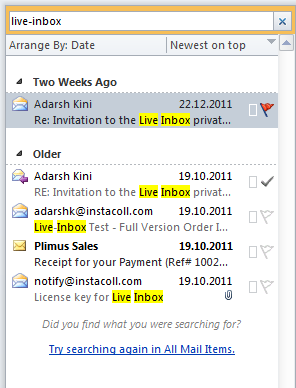 Looking at the information above, and the fact that Live-Inbox doesn’t have an alternative…I will keep on using Xobni. On the basis of your feedback, we are re-architecting some of the infrastructure elements and dependencies (things like VSTO) so that problems like the ones that you encountered are completely eliminated. Since we are doing this, we decided to update some other core components such as our indexing mechanism simultaneously and this is taking a bit of time. Sounds promising. I have accepted to test Live Inbox and will post updates about new versions here. Such a shame that Live Inbox hasn’t quite done what it set out to do yet. I do rather miss Xobni. It was just so useful and MS Outlooks Social Connector is useless. Come on Live inbox, get your act together! Thanks for the update on this Chris. There are surprisingly few reviews of Live Inbox on the web and I was almost going to take the plunge as I have xobni withdrawal symptoms, but think I’ll have to just deal with them for now. Social Connector at least has files and facebook sorted (not very well admittedly) for now. Have you tried the xobni infinity? This was their “replacement” for xobni. I found it next to useless. Chris – This post is too old. You should try the resurrected Live Inbox 🙂 Would love to see you back. Are you suggesting that the issues that I describe are all gone? Chris You should give it a try and let me know!! But If you ask me, I am pretty confident:)! As you can see from the post above, I have given Live Inbox quite a couple of tries and wasted way too much time with the product. I’m not going to do that again, especially not when you can’t even point out which of the flaws have meanwhile been fixed. I don’t doubt that the product has improved because otherwise it would hardly be around anymore. But after many years of software testing I have come to see that to judge the value of a software product, the company behind the software, in particular the developers, are as important as the actual code running on my computer (or on some server, for that matter). And the experience documented in the post above did not give me any confidence that this company will be producing viable software any time soon. I am ready to be proven wrong, but I’m not going to invest any time for another round of software testing. Chris, I started using LiveInbox in January 2017, have had no problems and find it very useful. (I am not affiliated in any way). – You refuse to continue an exploration you started yourself and know will be available to the public (with a reply that took you more time to write than I spent on installing LiveInbox.). Either be honest or take the post down. 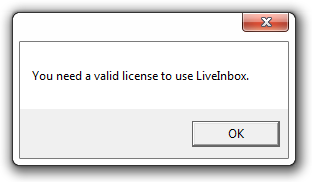 I will be honest: I found LiveIbox five months ago, installed it with no problem and use it every day. If you want to completement my live inbox review with a more up-to-date one that takes up my points of criticism, you are welcome to write one and post it here. In any case, I don’t see how my review is not honest. Hi Chris. I appreciate the reply. Your review is honest for 2011 and 2014. In 2017, for the current version, it is not accurate in my experience. People looking for info and who see this article (it is top level on Google) really do not get a reliable idea of the program. 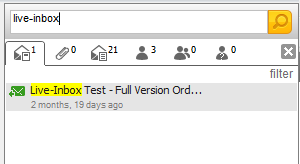 I am not affiliated, nor a real big fan of LiveInbox, but it has been worth my payment and is better than a slew of other Outlook stuff I have..
Don´t want to review it, not my thing, was looking for tips and was surprised to see this. The info is no longer accurate in my experience. That´s all.